Aromatic Cedar Aromatic Cedar (aka Aromatic Red and Eastern Red Cedar) tends to be a reddish or violet-brown mixed with a pale yellow color, which can appear throughout the heartwood as streaks and stripes. It has a distinct and tell-tale scent: the wood is commonly used in closets and chests to repel moths and other insects. 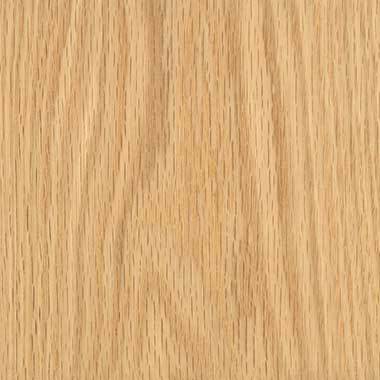 Ash Ash (aka American White Ash) is a light brown color, though darker shades can also be seen, which is sometimes sold as Olive Ash. 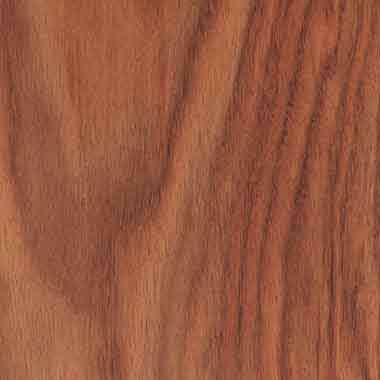 Sapwood can be very wide, and tends to be a beige or light brown; not always clearly or sharply demarcated from heartwood. Birdseye Maple Birdseye Maple is not technically a distinct species of Maple, but rather, its a figure thats occasionally found in Acer saccharum (Sugar Maple) trees. 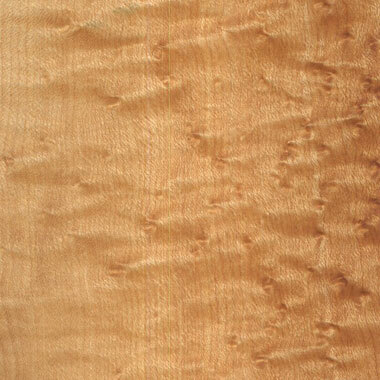 Its named 'birdseye' (sometimes simply written out as: Birds Eye Maple) because the figure resembles small birds eyes. 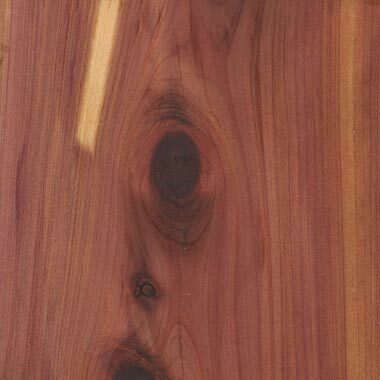 Bloodwood Bloodwood (aka Satine and Cardinalwood) for its obvious beautiful deep rose color. With age it's color does darken, but not significantly so it is a great wood to use in intarsia projects. The wood is very dense, with a tight fine, mostly linear grain. 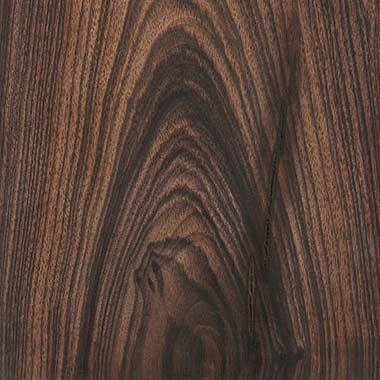 Bocote Bocote is an exotic wood native to Mexico, Central America, and the West Indies. It features a wide range of grain patterns from straight to wild, with curved lines and swirls. The color ranges from golden brown to tan to golden yellow. It is a hard, heavy, and dense wood, strong and stiff, with a medium texture. Mainly used for custom pool cues, cabinetry, veneer, furniture, inlays, knife handles, and pens. It polishes well with wax or polyurethane, and will take a moderately high natural gloss. 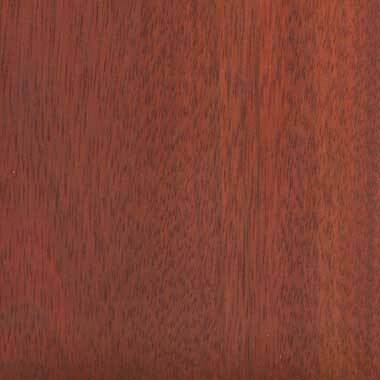 Bubinga Bubinga (aka Kevazingo) is an exotic wood from Central Africa. It is initially pinky-red, but darkens with age. It is popular for tool handles, decorative veneers, turnery, boatbuilding, knife handles, and can be used as an alternative to rosewood. Canarywood Canarywood is an exotic wood that is yellow to orange in color, typically variegated with light to dark red streaking. It has a medium to high luster. It can be some what variable in density, it is mostly a hard, heavy and strong wood. Works very easily with both hand and power tools and finishes very smoothly. An exceptional exotic wood from Africa. Chakte Kok Chakte Koi (aka Redheart) can be a very bright, watermelon redthough color can vary in intensity and hue from piece to piece: anywhere from a light orange/pink, (similar to Pink Ivory), to a darker brownish red. 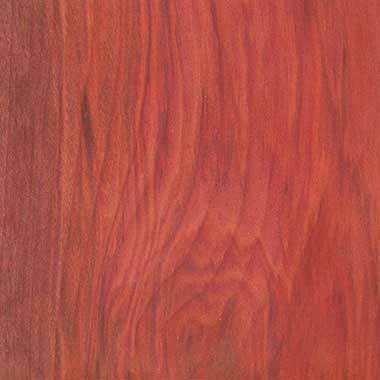 In some cases, it can look quite similar to Bloodwood, though usually with a more visible and figured grain pattern. 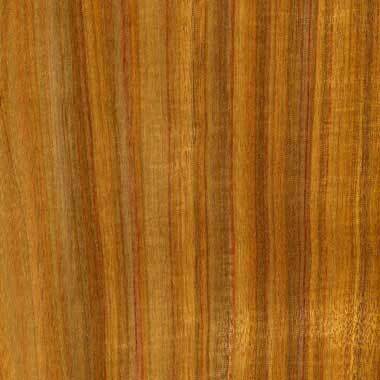 Chechen Chechen (aka Caribbean Rosewood) is highly varied, with red, orange, and brown contrasted with darker stripes of blackish brown. Color tends to shift to a darker reddish brown with age. 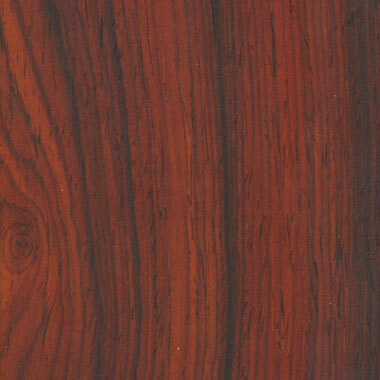 Cocobolo Cocobolo (aka Cocobola & Cocabola) is an exotic wood native to Mexico, Panama, Costa Rica, and Nicaragua, and is favored for custom pool cues, fine furniture and cabinetry, inlays, and musical instruments. The wood is very durable and strong, with a fine texture. It is extremely beautiful, ranging in color from dark red to reddish brown, with an irregular grain pattern. Cocobolo has fantastic working characteristics, making it a favorite for turning and carving, and finishes very smoothly. 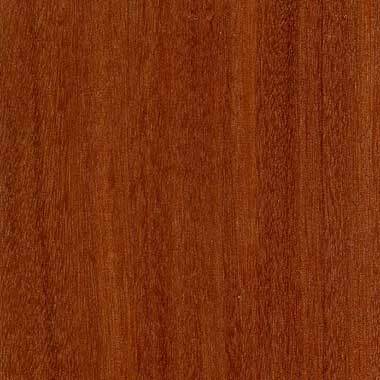 Cumaru Cumaru (aka Brazilian Teak and Tonka Bean) tends to be a medium to dark brown, sometimes with a reddish or purplish hue; some pieces may have streaks of yellowish or greenish brown. It is extremely stiff, strong, and hard, lending itself well to a variety of applications. It is sometimes used in place of the much more scarce Lignum Vitae. Curley Maple Curly Maple is not actually a species, but simply a description of a figure in the grainit occurs most often in soft maples, but is also seen in hard maples. It is so called because the ripples in the grain pattern create a three dimensional effect that appears as if the grain has curled along the length of the board. Other names for this phenomenon are: tiger maple, fiddleback maple, (in reference to curly maples historic use for the backs and sides of violins), or flamed maple. Gaboon Ebony Gaboon Ebony (aka African Ebony, Nigerian Ebony & Cameroon Ebony) is very rare. It is usually jet-black, with little to no variation or visible grain. Occasionally dark brown or grayish-brown streaks may be present. Hickory Hickory (aka Shagbark Hickory) is very dense and has good shock resistance and steam-bending properties. Sands, turns, stains, and polishes well. 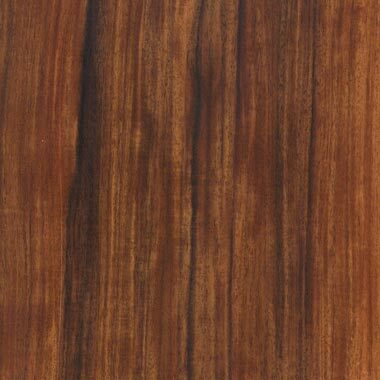 Imbuyu Imbuyu (aka Imbuia, Imbuya, Embuya & Brazilian Walnut) colors can vary substantially; typically medium to dark brown, sometimes with a reddish, golden, or olive-colored cast. Ipe Ipe (aka Brazilian Walnut and Lapacho) is from Central and South America. It can vary in color from a reddish brown, to a more yellowish olive brown, to a dark blackish brown; sometimes with contrasting darker brown/black stripes. 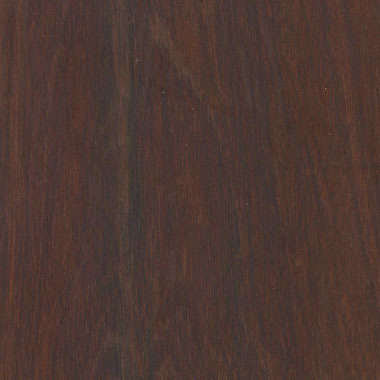 It can be difficult to distinguish visually from Cumaru, another dense South American timber, though Ipe tends to be darker. 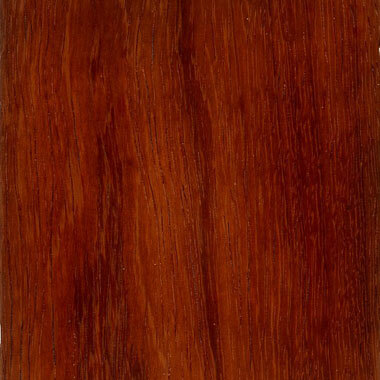 Jatoba Jatoba (aka Brazilian Cherry) is an exotic wood that runs from salmon-red to orange-brown. It darkens into a russet to reddish-brown color after drying, and it is frequently marked with dark streaks. It is reported to have good strength qualities and can be used in structural applications for which Oak would be suitable. It is reported to be similar to the African species, Tchitola, Black locust, and is superior to White oak. 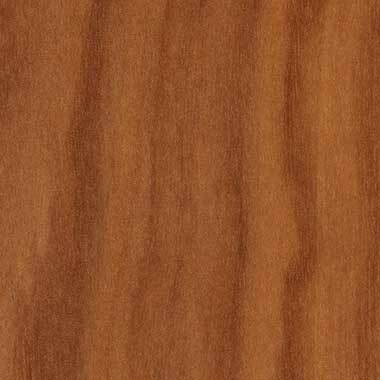 Kempas Kempas tends to be an orangish-brown, with an overall mahogany-like appearance. The grain is interlocked and sometimes wavy. 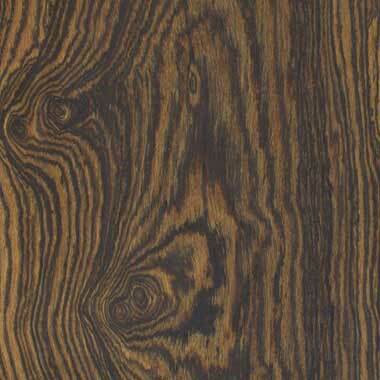 Macassar Ebony Macassar Ebony (aka Striped Ebony) has a dramatic striped appearance, somewhat similar to Zebrawood. Light to reddish brown body with darker brown or black stripes. 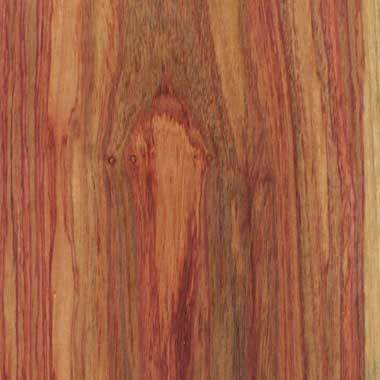 Makore Makore's heartwood is pink or reddish brown, sometimes with streaks of mild color variation. Yellowish sapwood can be two to three inches wide, and is clearly demarcated from the heartwood. Figured grain patterns (such as mottled or curly) are a common occurrence. Olivewood Olivewood is an exotic wood that is native to Europe, Africa, and the Middle East. It has a sentimental and religious significance to several cultures and religions. The wood is hard and strong, and has fantastic working characteristics, making it a favorite for wood turning and carving. 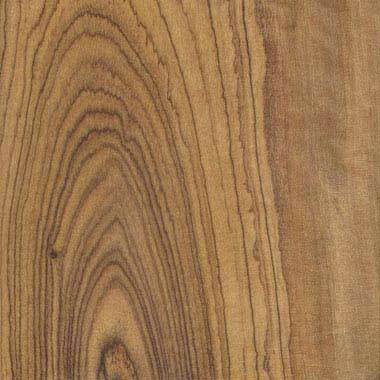 What makes this hardwood so unique is the extraordinary grain pattern of each individual piece, as well as the distinctive and inviting fragrance that it gives off. It even becomes darker, richer, and more beautiful in color as it ages! It has long been a favorite for religious, historical, and artistic artifacts. It finishes very smoothly, to a high polish. Osage Orange Osage Orange (aka Horse Apple, Hedge Apple & Bois d'arc) is an exotic wood from South America that is very dense. It is popular for turnery, handles, musical instruments and custom bows. Padauk Padauk (aka Vermillion) is an exotic wood that is a bright orange or almost crimson wood when freshly cut, but oxidizes to a darker, rich purple-brown over time - although it stays redder than Indian Rosewood. Slightly harder and heavier than Indian Rosewood it is a good wood in all respects - stable, and easy to work with. It often grows in small groups and is reported to be common in dense equatorial rain forests. 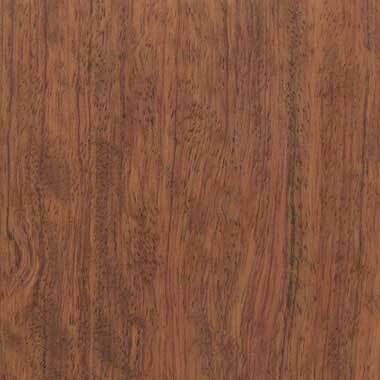 Pau Ferro Pau Ferro (aka Morado, Bolivian Rosewood and Santos Rosewood) is a wood of many names and because the wood is so similar in appearance and working properties to rosewood, it is also sometimes referred to as Bolivian or Santos Rosewood. 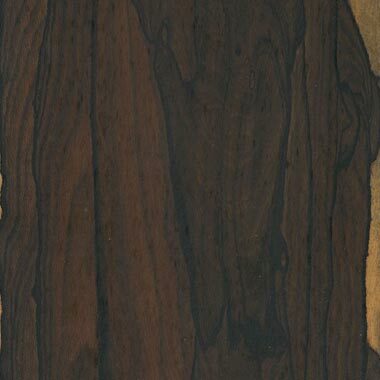 The wood has been used in various capacities as a substitute for the endangered Brazilian Rosewood. The color can be highly varied, ranging from reddish/orange to a dark violet/brown, usually with contrasting darker black streaks. 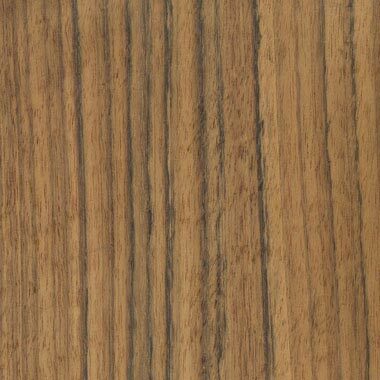 Poculi Rose Poculi Rose (aka Ebiara, Berlinia & Red Zebrawood) colors range from golden yellow brown to a deeper reddish brown, frequently with darker black streaks and stripes. 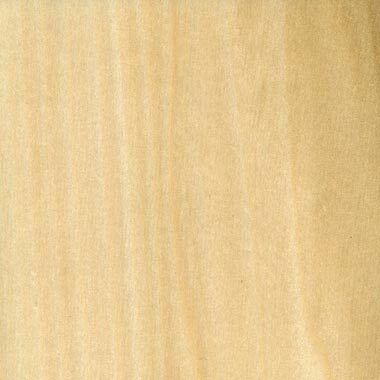 Poplar Poplar (aka Tulip Poplar and Yellow Poplar) is a utility wood in nearly every sense. Its used for pallets, crates, upholstered furniture frames, paper (pulpwood), and plywood. 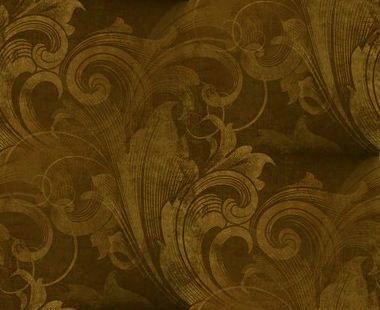 Poplar veneer is also used for a variety of applications: either dyed in various colors, or on hidden undersides of veneered panels to counteract the pull of the glue on an exposed side that has been veneered with another, more decorative wood species. Purpleheart Purpleheart (aka Amaranth) is an exotic wood with mechanical properties of the wood are reported to lie somewhere between those of Greenheart and Oak. It is reported to have exceptional tolerance for shock loading. 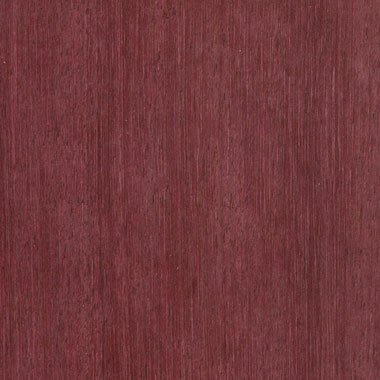 Purpleheart is reported to be highly desired by hobbyists and craftsmen who use the hard heavy wood in small projects. Red Oak Red Oak is a light to medium brown, commonly with a reddish cast. 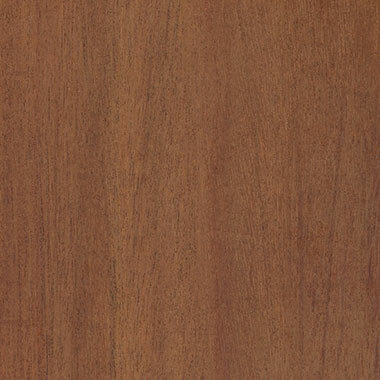 Santos Mahogany Santos Mahogany (aka Cabreuva) has a fair degree of color variation between boards of Santos Mahogany, ranging from a lighter golden brown to a darker purplish red or burgundy. The color tends to turn more red/purple with age. 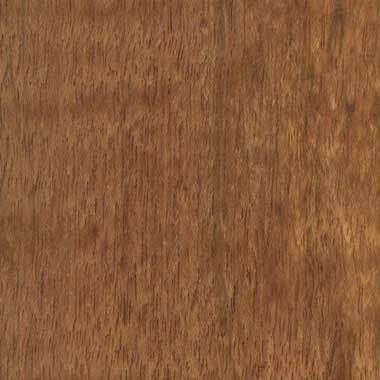 Sapelle Sapelle (aka Sapele, Sapelli & Sapeli) is a golden to dark reddish brown. Color tends to darken with age. The Common ribbern patterns can have other figured grain patterns such as pommele, quilted, mottled wavy beeswing and fiddleback. Shedua Shedua (aka Ovangkol) has varying shades of yellowish to reddish brown with darker brown, gray, or black stripes. 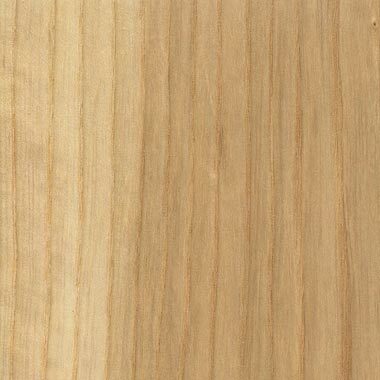 Moderately wide sapwood is a pale yellow, clearly demarcated from heartwood. Sometimes seen with a curly or mottled grain pattern. It is very similar in appearance to Tropical Olivewood. 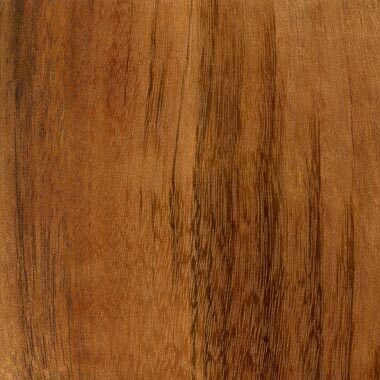 Tigerwood Tigerwood (aka Goncalo Alves and Jobillo) is typically a medium reddish brown with irregularly spaced streaks of dark brown to black. Color tends to darken with age. Tulipwood Tulipwood is an exotic wood native to the tropical region of South America, mainly Brazil. It is a hard and heavy wood, with a rather fine texture. 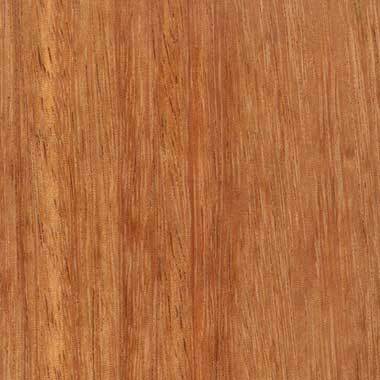 The sapwood is a solid yellow color, while the heartwood color ranges from a pink to a darker red, with a straw colored background. 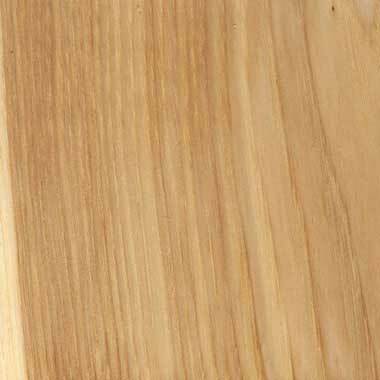 Tulipwood is excellent for wood turning, as well as knife handles, furniture, and cabinets. It is a lustrous wood, has excellent polishing qualities, and glues well. 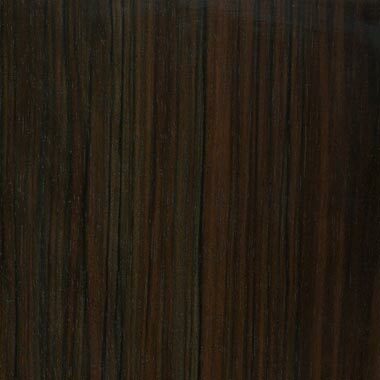 Vietnamese Ebony Vietnamese Ebony (aka Mun Ebony) is medium brown, sometimes with a reddish hue, commonly with dark brown to black streaks throughout. 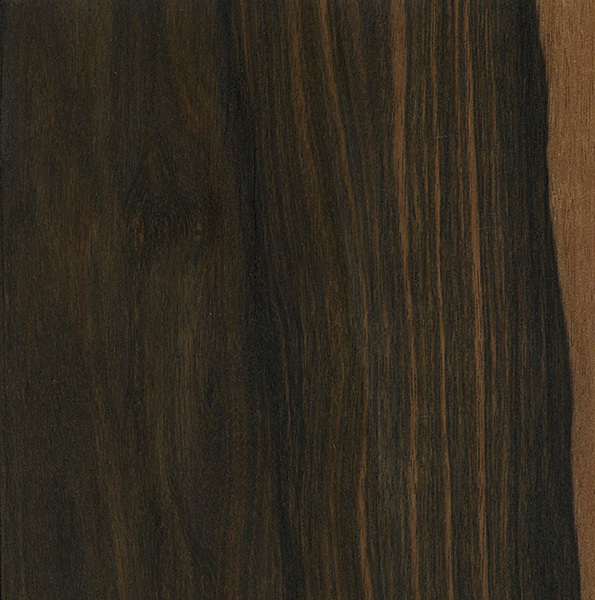 It is very similar in appearance to Macassar Ebony and Ziricote. 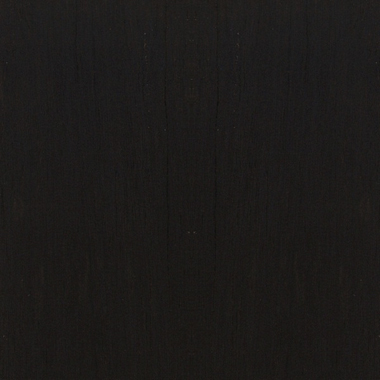 Wenge Wenge is dark enough to be used as a substitute for ebony. It is medium brown, sometimes with a reddish or yellowish hue, with nearly black streaks. Upon application of a wood finish (particularly an oil finish) the wood can become nearly black. 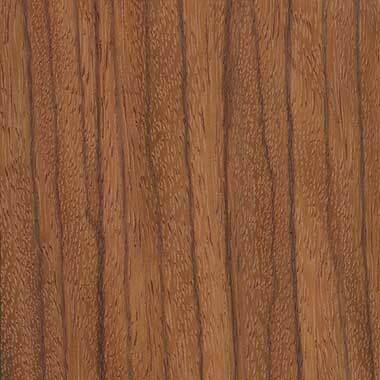 Zebrawood Zebrawood (aka Zebrano) is an exotic wood native to the Western African countries of Cameroon and Gabon. It is a hard wood, with a medium to coarse texture. 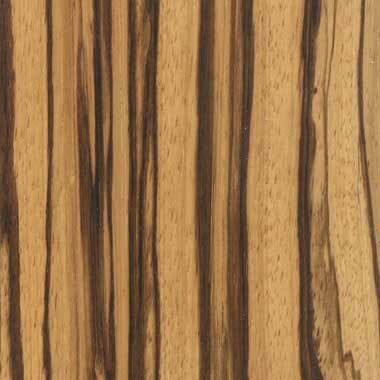 The Zebra-like appearance is due to the light colored sapwood in contrast with the dark colored grain. Zebrawood is excellent for wood turning, veneer, furniture, pens, and knife handles. It works and finishes fairly, and has good gluing properties. 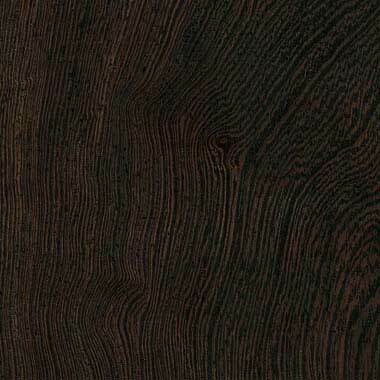 Ziricote Ziricote ranges from medium to dark brown, sometimes with either a green or purple hue, with darker bands of black growth rings intermixed. Ziricote has a very unique appearance, which is sometimes referred to as spider-webbing or landscape grain figure. 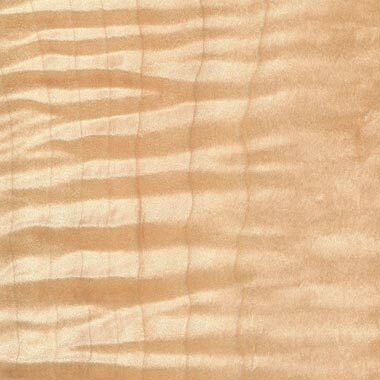 Quartersawn surfaces can also have ray flakes similar in appearance to those found on quartersawn Hard Maple. 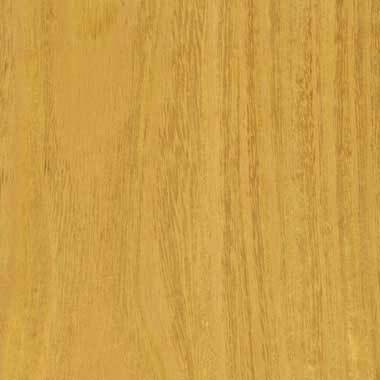 The pale yellowish sapwood is sometimes incorporated into designs for aesthetic effect, or to cut down on wastage.